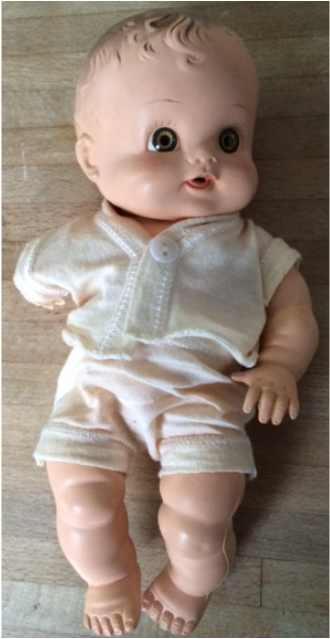 One of my sisters obtained this doll at one of the first doll shows that she attended. She liked the doll even though the rubber was starting to show signs of deterioration. It is interesting to note that Sun Rubber advertised their dolls as "Indestructible". Time is the kryptonite of all dolls, no matter what material they are made from. This doll conveniently identifies its patents on its back. This doll can't be repaired to as "new" without finding a parts doll and taking its arm. 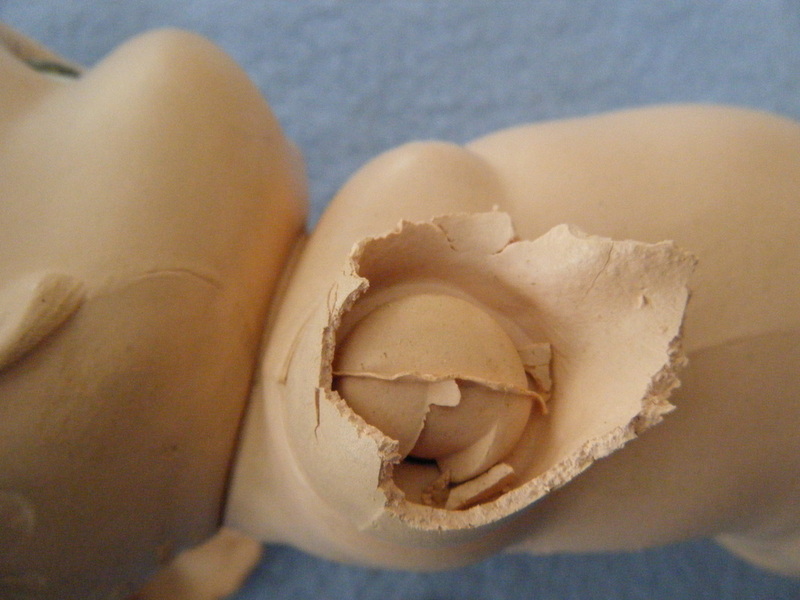 Unfortunately, most of this doll's mold mates are suffering the same deterioration. While not cost effective, it might be a good learning project to carve a replacement arm from balsa foam and then attempt to cast a replacement out of silicone rubber. This poor fellow has lost an arm. 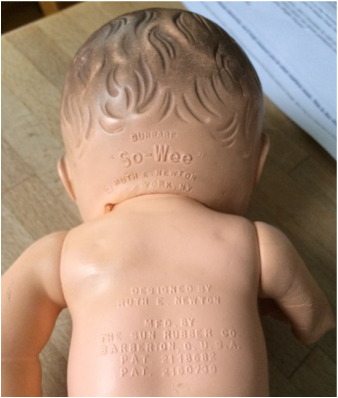 The back of the doll's head reveals the manufacturer's information and the designer's name. The body of the doll includes similar information as well as the patent numbers for the doll. As soon as I touched the arm it started to crumble away. There was no point in leaving the stump attached so I carefully trimmed the arm flange off. Side view of the shoulder "mushroom" where the arm mounts. 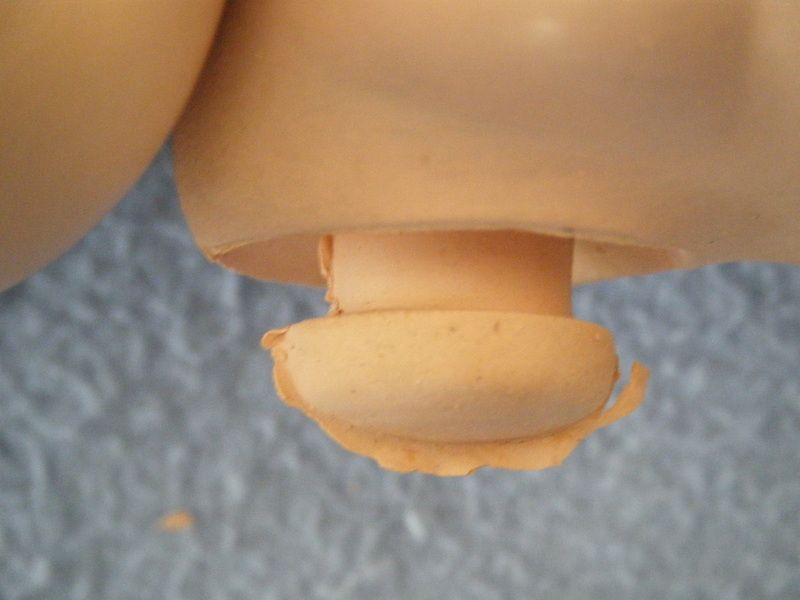 Notice the "flashing" or excess rubber from when the doll was molded. If the flashing didn't affect the operation of the doll then the manufacturer wouldn't bother to remove it as it would involve extra steps (hence more cost) in the manufacturing process. Such costs would be passed on to the consumer - making the toy less competitive in the cut-throat doll market of the time. 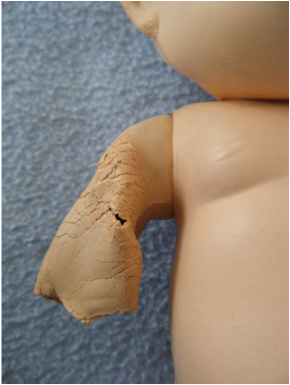 Removing his outfit reveals that the arm did not pop out of the shoulder joint - but rather deteriorated and broke off near the elbow. Close-up showing the deterioration of the arm. According to the information that I have been able to find, it is nearly impossible to preserve rubber dolls. The rest of the doll is probably headed for the same fate. This is good view of the "mushroom" that the arm mounts to. It is not showing signs of deterioration at this point. I speculate that the notch in the mushroom's cap is intentional and would act as a screw thread for twisting the arm flange over the shoulder joint. 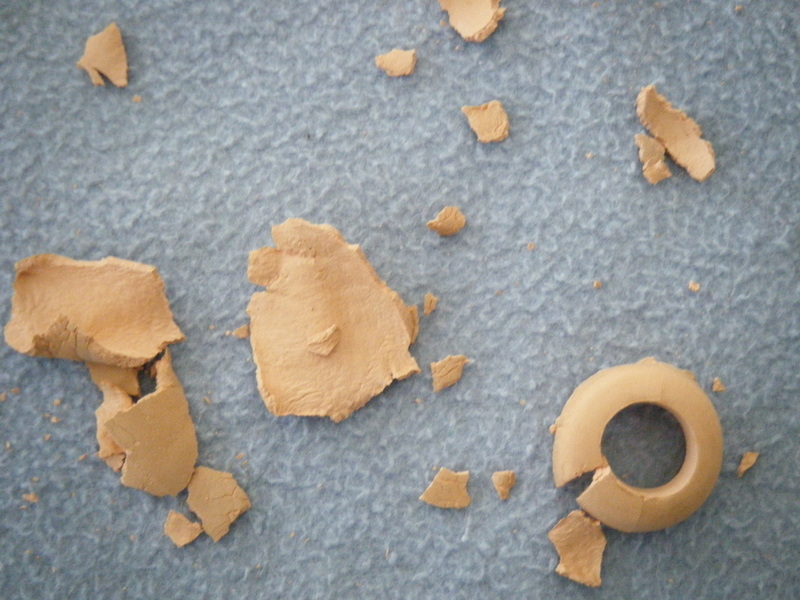 The crumbled remains of the Sunbabe's arm. 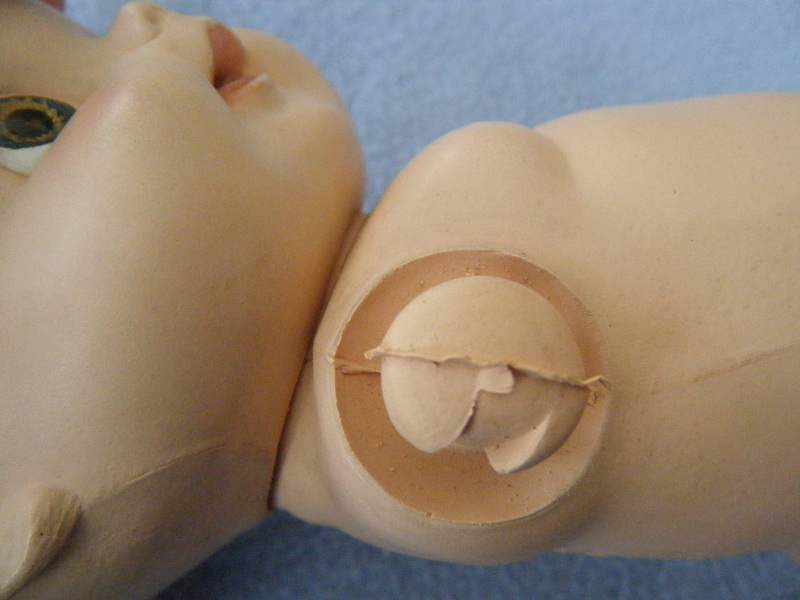 The shoulder ring in the lower right had to be snipped open to be removed from the doll. It was much thicker and had not deteriorated as much as the thinner walled arm itself.